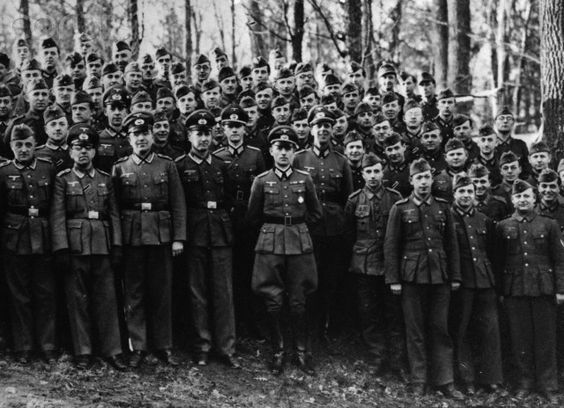 Reinhard Gehlen (front row centre) and Wehrmacht Counter-Intelligence staff. Despite constraints and restrictive limitations on military redevelopment the German military was rescued from its dissolution and reactivated in 1921. Surveillance of radical political associations and subversive movements was the central obligation delegated to postwar intelligence officers in the volatile Weimar landscape. The trade unionists and communists formed the prominent assemblies singled out for attentive monitoring, as did premature incarnations of the National Socialist German Workers Party (NSDAP). The Nazi Party, of course, later instituted its own independent intelligence service in 1931, known as Sicherheitsdienst (SD), translating to Security Service. The designation of military intelligence transformed many times after World War I. After demobilization of the German army the Intelligence Office became the Intelligence Group, attached to the Foreign Armies Branch of General Staff. National security requirements endowed on the reconfigured and adjusted intelligence departments were minimally altered and between 1918 and 1925 only perfunctory and domestic activities were permitted. The Intelligence Group experienced a designation realignment once more in 1921, and was then referred to as Abwehr [Defense] Group of T3. At a later juncture clandestine services would become a divergent branch of the Supreme Command of the Armed Forces (OKW). A foremost development in modernizing the German intelligence apparatus into mechanisms tailored for optimizing warfare was the appointment to Abwehr chief on June 2, 1932, of Captain Conrad Patzig, who previously had directed the naval section. In April 1928 the Abwehr Group of T3 and the German navy’s traditional espionage unit were amalgamated, and by October 1930 all the remaining quasi- independent service command intelligence agencies and connected departments were subordinate to the authority of a powerful defense ministry. By Conrad Patzig’s tenure the three military branches-navy, army and air force-while prohibited from engaging in intelligence gathering installed qualified liaison officers for distributing intelligence requirements to Abwehr counterparts. Generally, they maintained a second capability specializing in intelligence for analyzing and reportage of field information. Patzig’s selection was in multiple contexts a radical transfer and generally not anticipated by the establishment of military or other intelligence agencies as they then existed. Patzig was the first naval officer to command military intelligence, discontinuing the intelligence community traditions that demanded Wehrmacht chiefs, and his tenure was embroiled in criticism and perfidious internal fissures. The chiefs of staff and Field Marshal von Blomberg, recently elevated to minister of war, provoked a challenging environment that irreparably hampered covert infiltrations and asset construction. Blomberg was aligned with the Fatherland’s ideologically inclined Nazi Party factions, his proclivities sympathetic towards the party’s in- house intelligence branches. In the Conrad Patzig era, Eastern Europe, Russia and Poland were identified as initial primary targets for counterespionage activity. The German rearmament phase was still embryonic, both Wehrmacht and Kriegsmarine merely beginning to resemble the military capabilities of other world powers. By 1934, the necessary funding had not materialized for intelligence services. The Abwehr diligently conducted their surveillance operations across the Eastern European area as authorized, turning informants in Poland and Russia, but the scope and penetration achieved primarily basic results. Opportunities to engage in traditional espionage actions were exceptions and this generation of officers failed in obtaining substantive battlefield experience. The SS and Foreign Office technically comprised foreign intelligence briefs, but analysis reveals minimal development had occurred. Certain opportunities to uncover strategic information on nations or regions of interest were presented by cooperation and joint ventures with other foreign intelligence departments. An approach of pursuing relations with affiliated foreign agencies expanded the scope of domestic secret service operations. In Eastern Europe contracts for information exchanging and relationships of convenience were informally invested with intelligence agencies. Lithuanian state security, for example, dis- closed information on the Soviet Union. The final 1930s period transpired to be the watershed moments for German intelligence, as a sophisticated evolution was mandated beyond the simplistic operations of 1934; decisive tactical and strategic intelligence on Czechoslovakia and Poland was now petitioned by the Wehrmacht from 1937 to 1939. In 1938, the Ministry of War, belatedly following another jurisdiction review process, was abolished, undoubtedly enriching the Abwehr’s position. This latest reconstruction of internal institutions proved regrettable for Field Marshall von Blomberg who was unceremoniously removed at the instigation of Heinrich Himmler and his deputy, Reinhard Heydrich. The Abwehr now reported directly to the Supreme Command of the Armed Forces. Admiral Wilhelm Canaris, head of the Abwehr, the German military intelligence service, from 1935 to 1944. 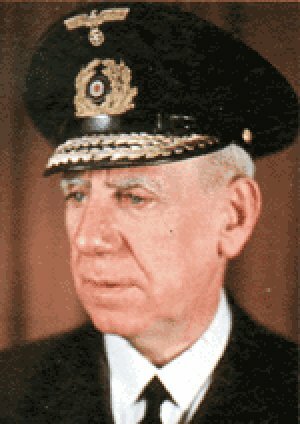 Admiral Wilhelm Canaris was appointed Abwehr chief, Germany’s supreme spymaster, on January 1, 1934. Similar to his predecessor and the confirmed vexation of many observers he was both resolutely not the preferred selection for nomination and a senior naval commander. On the surface an introverted and intellectual character, Canaris was approaching retirement age by the time of this promotion, his career background history reflecting a distinguished service inside the navy and accomplishments as a military officer. Admiral Canaris’s selection was unexpected because, despite his sustained years of commissioned naval and Abwehr service, he was not registered as a Nazi Party member and generally not construed as a party loyalist. Judging by SS and SD intelligence officers, Admiral Canaris’s composed and intelligent approach was a conspicuous contrast to the otherwise violent techniques practiced in his industry. His reputation during the oncoming years developed into that of an individual inextricably associated with the shadowy cloak- and-dagger world of espionage. It was under the stewardship of Canaris that German military intelligence developed its specialty of instigating networks of agents and informants physically on the ground and magnified in scale and proficiency to its greatest extent. 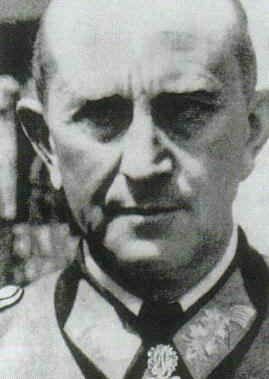 In British intelligence circles Canaris was perceived as an individual who understood Hitler’s self-declared historic mission with some skepticism, not that he relented in endorsing the reformation of Germany into a powerful European nation or the rearmament policies. In Canaris, similar to other military officers, nationalism formed inevitably as a byproduct of long- term service and, with the German World War I veterans, he bemoaned the decimation of the German navy and military following Versailles. Rearmament programs implemented within the Nazi regime appealed more to the spy chief than principles of national socialism or fascism. Between 1935 and 1937 Canaris bolstered the Abwehr’s interior framework considerably; from an organization of 150 personnel the agency had developed to nearly a thousand in less than three years. The old guard persisted in traditional aristocratic officers, individuals who had encountered their first military existence in the kaiser’s Imperial service. A modern generation from middle and professional social classes had voluntarily enlisted in the secret services after the war from academic, science, intelligentsia and civil service backgrounds. Within the intelligence community the officers advancing in promotion rapidly in Abwehr and SD or Gestapo commonly held discernible backgrounds in the Nazi Party. The Abwehr, however, persuaded military chiefs on the undoubted productivity in guaranteeing retention of a degree of independence and routinely recruited from outside the party ranks, enlisting both non-Nazi Party members and operatives disinterested in Nazism. Consistently diversifying its assortment of domestic personnel, the section chiefs decided to fine- tune agents with specialist skills, language, culture and technical backgrounds. Admiral Canaris and his department heads preferred intelligence and highly skilled operatives with ideological predispositions taking a backseat. New personnel were posted either at headquarters in Berlin or transferred to substations in German regional districts classified under the insider terminology as Abwehrstellen (Ast) divisions. While nominally independent ideology and party affiliation inevitably forcibly interfered in the streamlining recruitment processes, the SD’s winning an inter- nal battle was mandated an influence on selection. Recruiting an intelligence reserve was rendered obstructive because each individual candidate had to be rigorously screened by the Gestapo, and department commanders wanted to avoid being criticized for employing disruptive elements. Canaris’s organization by 1943 was 30,000 strong, of whom 8,000 were officers, and its expenditure budget for that year amounted to 31,000,000 Reichsmarks. Colonel (later Major General) Hans Piekenbrock, head of the Abwehr’s Abt. I, the section involved in espionage. 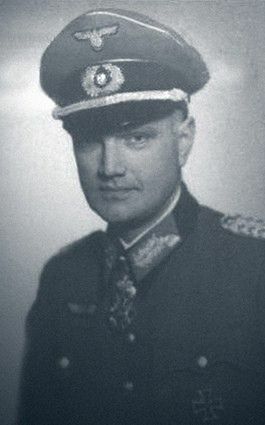 Generalmajor Erwin von Lahousen was head of Abt. II, the Abwehr section that organised sabotage and subversion. In 1940 the Germans decided to send agents and saboteurs to infiltrate Britain from Norway and Northern France. This plan was given the codename Operation Lobster (in German: Unternehmen Hummer) and was directed by von Lahousen. He was also a member of the German Resistance and a key player in attempts to assassinate Adolf Hitler on March 13, 1943 and July 20, 1944. Colonel (later Major General) Fritz Eccard von Bentivegni, head of Abwehr section Abt. III, security and counterespionage. Canaris simultaneously established the networks of Ast units and substation officials. His inner council of section chiefs (Sections I, III and III) were extremely dependable and primarily hand- picked. For the first three years of World War II Canaris ensured that Piekenbrock, Lahousen and von Bentivegni, the senior section chiefs, maneuvered independently, the bureaucratic arguments isolated if feasible from the command staff. Preparations for military engagement finally instituted a department format that endured from 1938 until the culminating twelve months of World War II. The umbrella canopy of the organization was combined from three distinct central departments: Section I-Espionage; Section II-Sabotage; and Section III-Counterespionage. Section I controlled substations, with command staff managing field operative networks engaging in espionage and counterespionage targeting foreign nations. 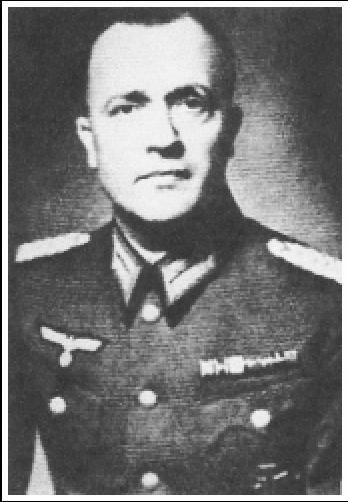 Colonel Piekenbrock was appointed the chief of Section I and retained this official posting until his unfortunate transfer to the Eastern Front in 1943 and subsequent Soviet imprisonment. Abwehr I, the largest division section, consisted of nine subordinate groups: Army East; Army West; Army Technical; Marine; Air Force; Technical/Air Force; Economic; Communications and Secret. Section II and Section III overlapped jurisdictions, with engagements in multifarious actions of sabotage and counter sabotage specialties. Missions of Sections II and III units were deliberately shrouded in ambiguous mystery. Another division attached to Section III occupied a commission for surveil- lance of domestic industry in commercial and munitions factories. Other departments included the Naval Intercept Service (a former OKW organ), a structure transferred to the Abwehr in the late 1930s. Naval Intercept retained its function in signals communication. The Foreign section was an auxiliary administrative department operating as a liaison and dissemination station with the OKW and Foreign Ministry. Commanded by Vice- Admiral Buerkner, this department was traditionally external to spying operations. Abwehr headquarters delegated local functions expansively to field offices. As the Nazi empire expanded and encompassed new geographical territorial acquisitions an Abwehr substation was rapidly set up. The standing objectives seldom experienced any modification: providing the latest information to the Wehrmacht. In Germany and occupied countries the field branch substations were referred to as Abwehrstellen (Ast) and Nebenstellen (Nests) branches; in neutral countries the Abwehr officially designated substations Kriegsorganisation (KO). Under security procedures the KO substations acted in concealment as undercover attachments of the diplomatic missions, and the field stations reproduced the functions of the headquarters divisions in recruiting, training and dispatching espionage agents and informants. While in theory separation of geographical substations com- posed practical intellect the espionage business necessitated a significant amount of overlap, either resolved in combined missions or jurisdictional wrangling. The Abwehr during wartime operations achieved notable results and developed a reputation for ruthless efficiency. Nazi agents uncovered a majority of The Netherlands underground resistance movement and for a time con- trolled its actions. The Blitzkrieg attacks in Poland and Czechoslovakia were effective because Abwehr operators had assiduously procured the allegiances of collaborating security personnel. National border defenses and security contingency plans were comprehended long before engagements had commenced by Wehrmacht commanders General Franz Halder and General Walther von Brauchitsch. Canaris’s central policy upon taking command was dedicated to expanding the number of confirmed operatives abroad for the calculated purposes of delivering information on America and the Western Atlantic military. Commercial and industrial information, technical data and personnel records were delineated as fundamental intelligence requirements by General Lahousen, the commander of Abwehr II. Concerning the United States, prior to the late 1930s period and the emergent European warfare the Führer’s Germany had demonstrated minimal interest and failed to devote significant attention or realistic planning to the possibility of military conflict in the American theater. In March 1938 the Kriegsorganisation were assessed as insufficiently financed and fragmented, senior Nazi officials either discounting or overlooking the possibilities for deep penetration by clandestine networks in United States or Britain. Interestingly, a Nazi espionage network was in existence inside the United States dating from 1935 and Nazi Party manifestations originated in United States territory in 1933 with the assumption of power. But primitive and markedly limited covert operations appeared copiously deficient in specialist or military personnel and of course financial investment. German expatriates living in America, either as naturalized citizens or extraterritorial guests, formed the listening stations of Nazi intelligence services. Before the Wehrmacht forces summarily occupied Poland in September 1939, and before Pearl Harbor on December 7, 1941, the United States represented a frontier where most Abwehr commanders had repeatedly confirmed an exigent policy in treading circumspectly. At that time positive diplomatic relationships with North and South American nations were interpreted as being fundamental to conserve. The Foreign Office generally objected to exploiting embassies and legations as convenient cover and inevitable disruptions to their fusion of international ties. This entry was posted in Germany, Intell by MSW. Bookmark the permalink.